For 14 years, Portlanders have pumped their fists to electric riffs and swayed with rhythmic melodies at the intimate Doug Fir Lounge. A distinguished lineage of musical legends has graced its stage, performing unforgettable shows for small but robust crowds. High quality production and above all, the supreme sound of the space has attracted illustrious acts from The Shins to Vampire Weekend, Cake and Alabama Shakes, to name a few. The excellent live shows are a long established institution, but now some of that rock and roll has made its way upstairs. Doug Fir is more than just a music venue, and through a vibrant and colorful rebranding strategy, the East Burnside business is bringing the creativity and energy to the restaurant and two bars – making them better than ever. From the ingredients to the menus, a higher standard is being set and the results are delicious. While staying true to the original vision, the food has been cleverly reimagined, built on relationships with local farms and fresh seasonal bounty. 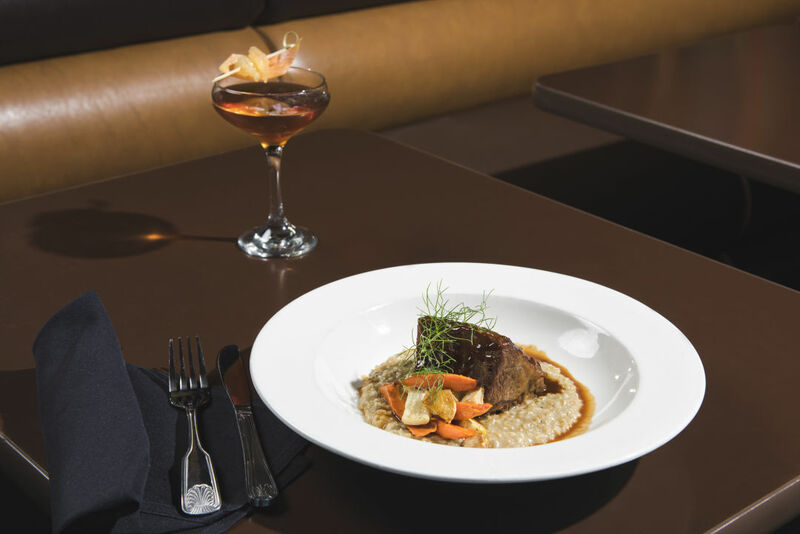 Flavorful, hearty meals such as braised short rib, mushroom risotto and spring gnocchi are savory comfort dishes fitting for the dining room’s mid-century log cabin interior. Ginger soba noodles, black bean sambal and asparagus, or fried cauliflower mixed with golden raisins and peanuts are popular vegan options, playfully marked by a flying-V guitar on the menu. There’s really something for everyone. As the substance of the dining experience has elevated, Doug Fir has also made sure not to take itself too seriously, keeping things lighthearted. Astrobright paper menus, an homage to the distinctive neon tinted concert posters, have replaced traditional, cork-bound books. Humor is a theme throughout, from appetizers like corn “Dougs” and bahn mi(t) balls, to reprinted, unsavory Yelp reviews and Doug Fir inspired horoscopes in the back. Kids menus even have a Nickelodeon-esque Kurt Cobain coloring page. Bar manager Kyle Ritchie has big plans on the libation side, modernizing the approach while getting back to his own roots. “I finally found my niche combining my culinary and molecular side with cocktail making,” says Ritchie. “Everything is as local as we can get behind the bar. 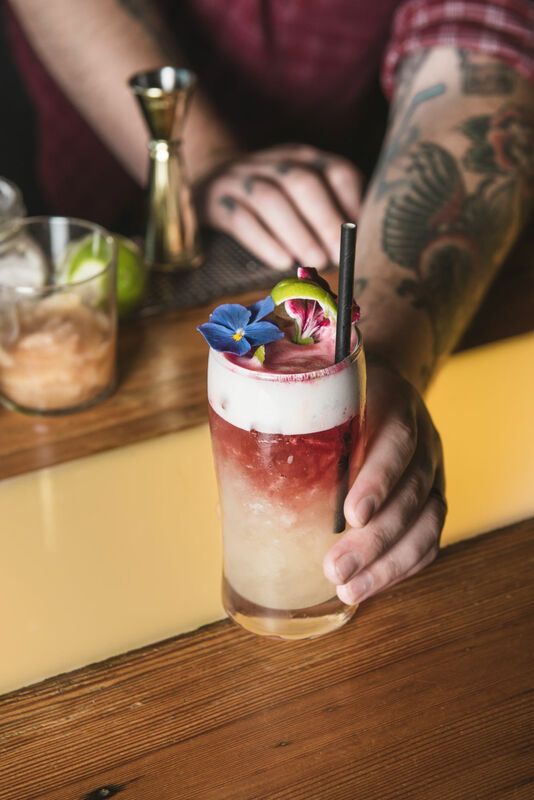 We’ve got the pick of the northwest produce and berries, even down to herbal things like wild ginger in Oregon.” Exciting concoctions at a reasonable price, such as clarified mimosas or the upcoming, wintertime hot beverage lineup make Doug Fir an alluring spot for drinks year round. That originality most recently manifested in a partnership with a nearby brewery. Doug Fir wanted to craft a one-of-a-kind beer, drinkable, light but flavorsome, for bands to crush before going onstage and fans to sip on. Culmination Brewing answered the call, and the Green Room black lime kolsch ale was born. It was so popular, it ran out in the first month, but thankfully a quick brewing process will keep the supply flowing, providing touring musicians with an exclusive taste of Portland. 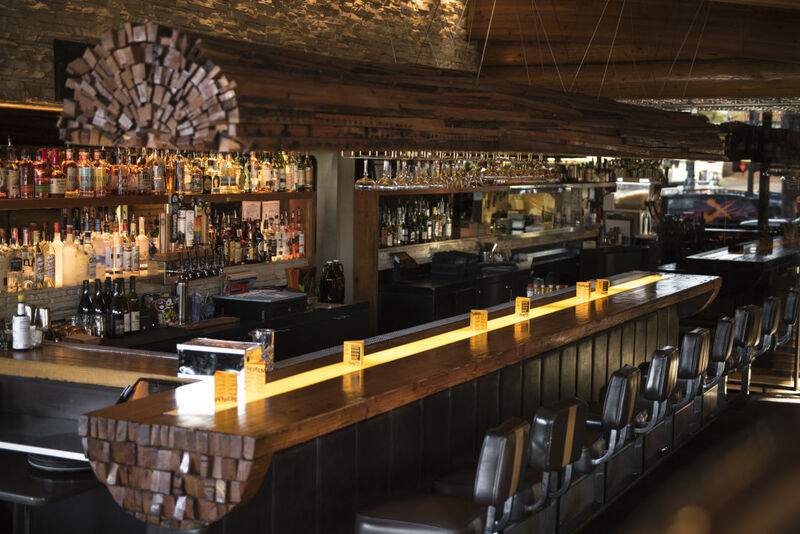 Doug Fir has certainly come a long way since founders Mike Quinn, John Plummer and Jeff Kovel decided to build the lounge alongside the neighboring Jupiter Hotel, a 1960’s motor lodge renovated into boutique accommodations. But, constant improvement and a dedication to staying on trend means innovation continues to blossom, especially with Doug Fir’s exceptional catering and unique rentable spaces. “Nothing really is out of character, it just works,” explains Bert. “This place has been known to do drag brunches. People get married here. There have been a lot of people who have met here and started dating.” It’s the perfect setting for memorable public and private events, including charity benefits, yoga sessions and holiday parties. A recent ticketed dinner put on by Veganizer, featuring a surprise, six-course meal, sold out, as did the extra seating. In essence, Doug Fir is a microcosm of what makes Portland so great – to appreciate it, just look at the crowd. You might see guests in beanies and Metallica t-shirts, finely tailored suits or Carhartt pants and boots. It’s classy and casual at the same time, but most importantly, as Doug Fir looks to the future, one thing remains the same. “We’re here for everyone, but in our own way,” says Bert. 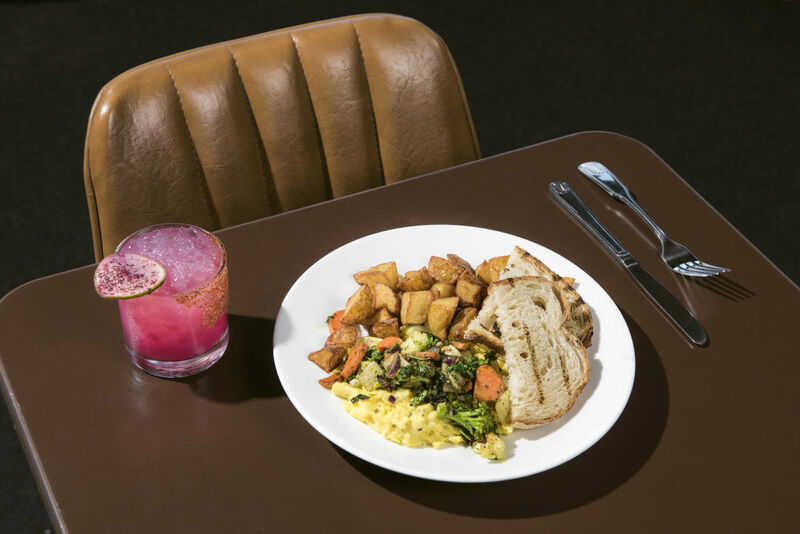 Doug Fir Lounge is open from 7 a.m. to late everyday, serving breakfast, weekend brunch, lunch and dinner. Happy hour is offered at the bar, every day from 3 to 6 p.m. and Monday through Thursday, it’s available again from 10 p.m. to midnight.